English numismatist and lawyer; died in London Feb. 18, 1895; son of Samuel Moses (having later assumed the name ofMontagu); educated at the City of London School. Articled to a firm of lawyers, he passed his final examination with distinction, and established himself as an expert in bankruptcy law. In early life a collector of beetles, he afterward took up coincollecting, which he pursued with enterprising industry, becoming a numismatist of the highest rank. He presented a valuable collection of coins to the British Museum. His principal works on numismatics are: (1) "Catalogue, with Illustrations, of a Collection of Milled English Coins Dating from the Reign of George I. to that of Queen Victoria" (1890); (2) "The Copper, Tin, and Bronze Coinage, and Patterns for Coins of England from the Reign of Elizabeth to that of Queen Victoria" (1885-93). His collection of Greek coins was especially noteworthy; and the sale catalogue of it became the standard work on the subject. He was the author of many essays on coinage, contributed to the publications of learned societies, and was a fellow of the Society of Antiquaries. 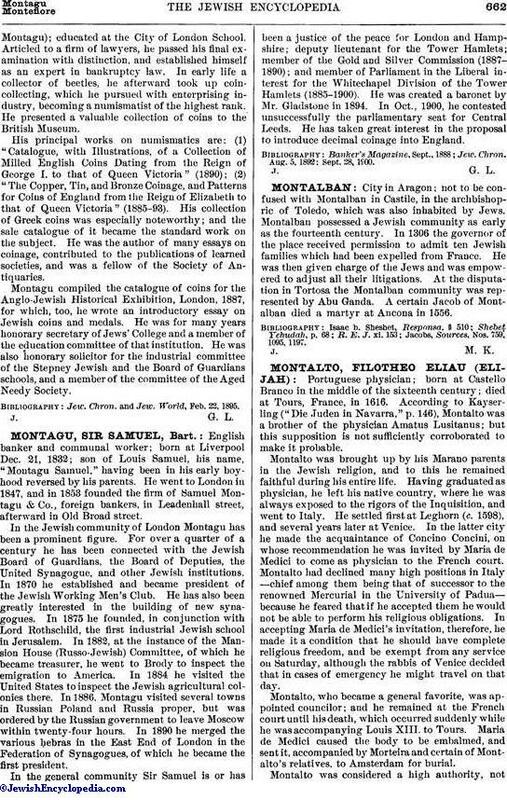 Montagu compiled the catalogue of coins for the Anglo-Jewish Historical Exhibition, London, 1887, for which, too, he wrote an introductory essay on Jewish coins and medals. He was for many years honorary secretary of Jews' College and a member of the education committee of that institution. He was also honorary solicitor for the industrial committee of the Stepney Jewish and the Board of Guardians schools, and a member of the committee of the Aged Needy Society. Jew. Chron. and Jew. 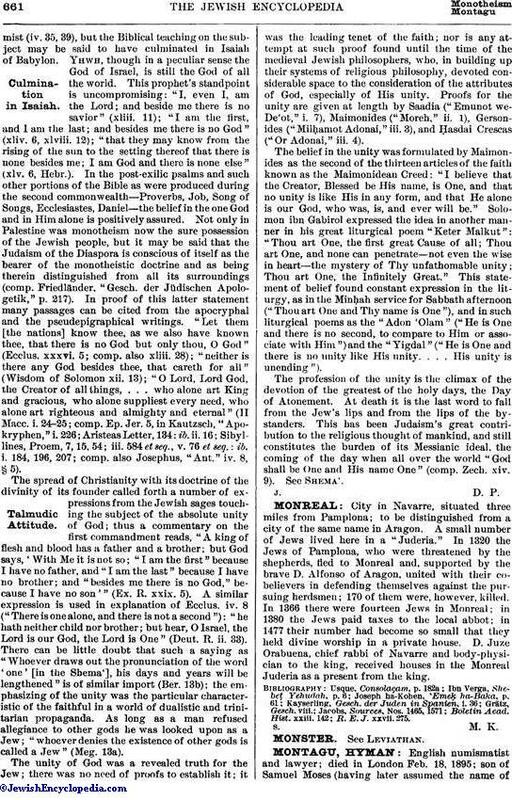 World, Feb. 22, 1895.